Properties in Saint-Léon-sur-Vézère average 4.6 out of 5 stars. The Ensoleillade Ecological small wooden chalet of 19m2 in garden with view. Property 7: The Ensoleillade Ecological small wooden chalet of 19m2 in garden with view. Property 24: Perigordine House surrounded by nature. 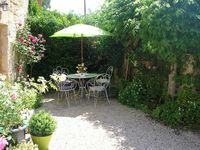 Petit Paradis in the heart of the Dordogne, the place to enjoy "The Good Life"! Property 28: Petit Paradis in the heart of the Dordogne, the place to enjoy "The Good Life"! Property 32: House 6 people, private pool. Rural Gite in a pleasant area, quiet, verdant, typical house - gite "bertrand"
Property 40: Rural Gite in a pleasant area, quiet, verdant, typical house - gite "bertrand"
Rural Gite in a pleasant area, quiet, verdant, typical house - Logement 1778303 gite "vergnolle"
Property 50: Rural Gite in a pleasant area, quiet, verdant, typical house - Logement 1778303 gite "vergnolle"
We had a great week here. There is a nice small garden where you can enjoy meals cooked in your own kitchen. The bed is small, really a double, with two singles upstairs. There is no WiFi, you have to go to the Tourist Offuce for that. If you&rsquo;re not used to French appliances, then we wrote instructions in english to help you figure them out. All in all, a wonderful place to stay in Les Eyzies!